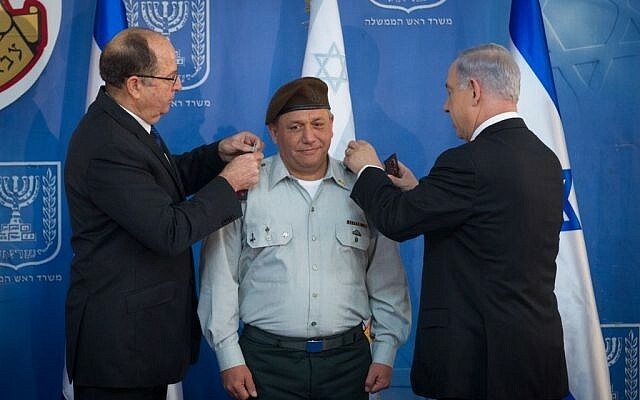 Lt. Gen. Gadi Eisenkot assumed command of the IDF Monday morning, succeeding Benny Gantz and becoming the 21st chief of staff. At a ceremony at the Prime Minister’s Residence, Eisenkot, 54, said he was taking the helm at a time that was “tense and full of challenges,” and asserted that “only a strong army” would be able to carry out its task of deterring and winning wars. Others also highlighted the security challenges Israel faces. Prime Minister Benjamin Netanyahu took the opportunity to warn about the growing threat of the Iranian “empire,” saying that the next four years would be more dangerous than the previous four. He praised Gantz as “an officer and a gentleman” who served the state of Israel for the better part of four decades. Reflecting on his four-year tenure as head of the IDF, Gantz said that he “did everything, despite the difficulties” to defend the state of Israel. “We fortified our borders well. We trained in responses on all our borders and secured our readiness for any incident at any time,” he added. In a possible reference to strained ties with the United States over differences in dealing with Iran’s nuclear program, Gantz said that it’s important that Israel maintain relations with its allies and not become isolated.